We are regarded as the leading brand offering highly efficient Cashew Peeling Machine. This machine is broadly used in food industry for peeling cashew nuts. Provided machine is manufactured from the premium quality components and advanced technology, our professionals assure our clients that this machine is manufactured as per the defined industry standards. Bundled with high utility features, this milling machine is firmly accepted in the market. 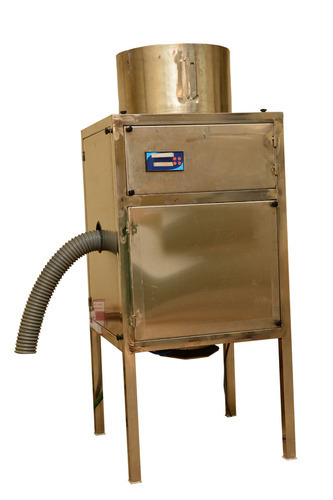 Incorporated in the year 2012, in Junagadh (Gujarat, India), we “Heaven Kajuwala Industries” are the leading manufacturer and supplier of high performance range of Cashew Processing Machine, Cashew Nut Dryer Machine, Cashew Peeling Machine, Cashew Kernel Separator, Raw Cashew Grader (4 grade with 95% Rusult), Cashew Grading Machine, Cashew Nut Boiler Machine, Manual Cashew Nut Cutting Machine, Automatic Cashew Nut Cutting Machine, Finished cashew grader etc. The offered products are manufactured at our infrastructural unit using latest technology and quality tested raw material in compliance with the defined industry standards. The infrastructure unit helps our professionals to manufacture our products at a very fast production rate. We have divided our infrastructure into several sub-units such as production, manufacturing, procurement, quality testing, research & development and warehousing & packaging. All these divided sub-units are supervised by our highly skilled workforce who has rich industry experience and knowledge. We offer this range to our clients according to their exact needs.